From out of nowhere the call came: "Would you like to set up some Apple Power Macintosh G3 all-in-one computers?" The response was almost instantaneous: "Set up some what?" Above the rainbow logo at the top is the small opening for the built-in microphone. The built-in speakers are on the sides at the bottom. Above the space for the Zip drive (left) and the floppy drive (right) are the jacks for headphones; you can plug headphones into both ports simultaneously, plus a third port at the rear. Centered between and slightly above the drive slots is a lighted button for controlling volume. The CD-ROM in the middle at the bottom is about the only conventional component. 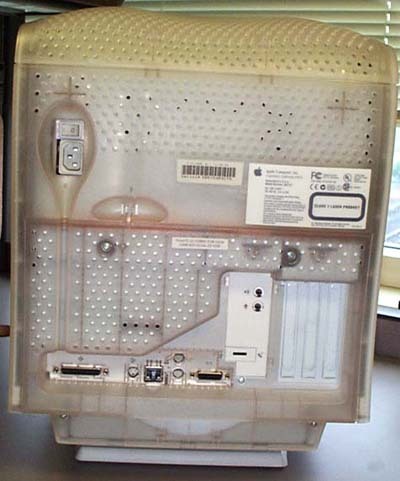 The semi-mythical "Apple Power Macintosh G3 all-in-one computer" has a name to die for: you can die for lack of oxygen just trying to say it. Apple has restricted sale of these machines to "the education market," which is variously described as schools offering anything from kindergarten through graduate school classes, plus teachers, professors, students, boyfriends and girlfriends of students, school staff members, and PTA members with connections. Would Washington Apple Pi Labs be interested in setting some up? "What did you call this thing again?" The first thing to check, of course, is "your place, or mine?" When checking out a new computer, it is best to do all testing in a controlled laboratory setting, in order to reduce contaminating influences. Deep in the heart of Washington Apple Pi Labs, past an unsteady pyramid of dead ImageWriter I carcasses and slightly to the left of a forlorn Lisa with a Twiggy drive, there is the Washington Apple Pi Controlled Laboratory Setting, the Test Bench. As the cleanest and (occasionally) clearest horizontal surface in the Lab, The Bench features the Lab's two most prize possessions: almost an entire square foot of desk space and a working 3-prong grounded multi-outlet extension cord. We were ready. "We'll set them up here." "They have six of them." "We'll set them up there." In The Beginning, Macintosh computers shipped in white cardboard boxes. Over the years, in a combination "eco-friendly" and "save pennies on printing" move, the cardboard boxes became unadorned, pasteboard brown cardboard. 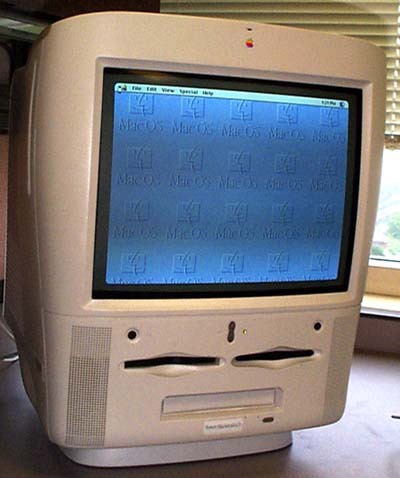 The Apple Power Macintosh G3 all-in-one (hereafter referred to as the "G3-AIO") boxes were different: they were IBM blue. OK, blue and white. OK, blue and white with some black lettering. But most obviously: IBM blue. With white Apple logos. After the box, the next thing you notice is: they are heavy. According to the Technical Information pamphlet that ships with every G3-AIO, a single machine is 27 kilograms, or 59.5 pounds, or one heck of a lot when they are stacked three high in a narrow space. While it is possible for a single large, stupid person to uncrate one (or even six) of these without assistance, Don't Do This. The machines are heavy, and the boxes are deep. You can fall into a box and never be heard from again. You can rupture vital organs of a personal nature. Accept the fact that this is a two-person task. Particularly since you will have to move them multiple times. Receiving has to officially receive them and barcode them. They will need to be carried hither and yon and placed on the desks of their new users. They will need to be picked up and carried somewhere else after it is determined that it shouldn't be that user, but this user. You may recall the simple formula from your physics classes: work equals energy over distance. So: six machines times 60 pounds times 3,812 miles in an afternoon equals: at least a two person job. The unusual translucent top, filled with hundreds of holes, curves over the back as well. Note that the connector for the power cord is recessed, as are the (from left to right) SCSI port, ADB port, 10BASE-T Ethernet port, modem and printer port, and video port along the bottom edge. The back covers of the three PCI slots are on the far right, also recessed, as is the blank space for the optional audio-visual circuitry. Why is all this recessed? So that teachers and students can push the machines as close to the wall as possible without damaging the cable connectors.